Always dreamt of a fairytale wedding? 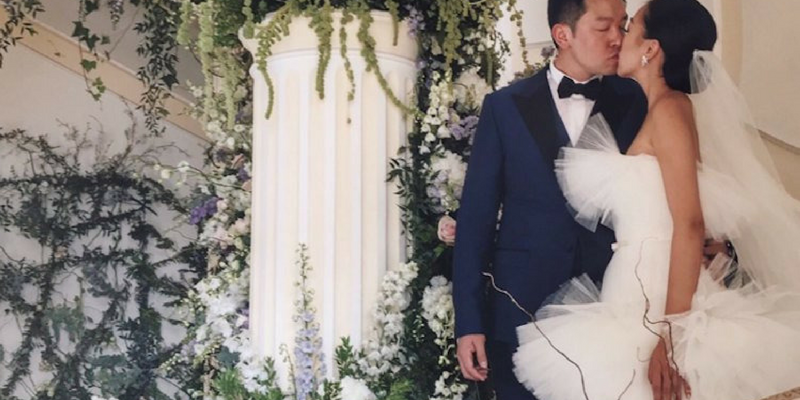 Take a look inside the wedding of Fashion blogger Feiping Chang and Financier Lincoln Li, a luxury yet elegant wedding extravaganza in Capri, estimated to have cost the couple millions. No expense was spared for the decadent affair, with celebrations kicking off with a welcome dinner for 150 guests at the world-renowned Da Paolino restaurant. The second day seen guests having a relaxing brunch at the La Conca Del Sogno beach club before the couple tied the knot on the third day in the clifftop Villa Lysis- the first EVER wedding conducted here as granted by the government. The couple agreed to refurbish the location of their wedding vows, even building a bridge to link the grounds to the top of Villa Lysis, making this a truly one-of-a-kind wedding. Guests were welcomed into the reception with custom-made hand-embroidered bags, and treated to a sumptuous three-course feast. They then access to a ‘dessert room’ which was overflowing with delicate sweet treats. The decor was simply out-of-this-world, as they covered everything in rich white, pink and purple flowers nestled with delicate greenery. This wedding was certainly the stuff of bridal dreams!